I’m still a relative novice in the world of running, having picked up the hobby around two years ago, but I knew from early on that a marathon was something I’d like to try my hand (or feet) at some day. After sadly missing out on the marathon in LKT’s home city of Manchester earlier this year due to injury, I was finally able to make my debut last week at the Berlin Marathon. 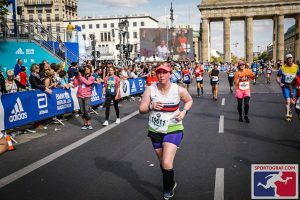 It was a daunting prospect: part of the Abbott Series that comprises the world’s six major marathons, Berlin is a huge event that attracts more than 40,000 runners from across the world. Ultimately, though, it was an exciting one too – where could have been better to participate than the capital of one of my favourite countries? Long-distance running is as much a mental pursuit as it is a physical one, so aside from my main goal of simply getting round the 26.2 miles (or 42.195 kilometres, as the marathon banners frequently reminded us!) in one piece, my other plan was to treat the race as a city tour around Berlin – allowing me to distract myself from counting the miles by focusing on the sights and sounds of one of the world’s great cities. Although I had previously visited Berlin on a couple of occasions, the marathon route was due to take me to some parts I hadn’t seen much of, like Kreuzberg and Moabit, and I was looking forward to that. The day brought sun and a little humidity – slightly higher temperatures than those of us accustomed to training in the UK would have liked, but very reasonable compared to the heights of 28 and 30°C that hit the city in the days that followed! Starting slap-bang in the city centre near the Siegessäule, and completing a lap of several major sights including the Fernsehturm and the Kaiser-Wilhelm-Gedächtnis-Kirche, the route promised plenty of distractions from thinking about where the next water stop was and how I’d conquer the last ten kilometres (I hadn’t run more than 32 kilometres in one session before the event). Thanks to the sights and the wonderful spectators and bands encouraging the runners all the way round, I was fortunate to avoid hitting the infamous runners’ wall too badly – although a couple of difficult points certainly stick out. At Karl-Marx-Allee, around 12 kilometres in, the sun suddenly emerged from behind the clouds and reflected off the imposing, pale-coloured East German structures that line the boulevard, making the conditions feel suddenly much warmer and more of a struggle. Later on, plodding towards the 35-kilometre mark and wondering how I’d ever manage the last seven, I was so wrapped up in my own thoughts that I only realised we were on the Kurfürstendamm – probably Berlin’s most famous shopping street – by the time we had almost finished that stretch. The Berlin route is cleverly structured so that participants get a final boost at kilometre 42 by running through the Brandenburg Gate. Despite the slog of the previous few kilometres, rounding the corner and suddenly seeing the gate up ahead helped me to dig into some final reserves of energy, and make it through the columns and over the line. One of the event’s amazing volunteers popped a medal around my neck, and just like that, it was over. Refuelling with some currywurst and Berliner Weisse beer later on, I was reminded of a sign that several groups of spectators were holding up throughout the route: Der Schmerz geht, der Stolz bleibt!